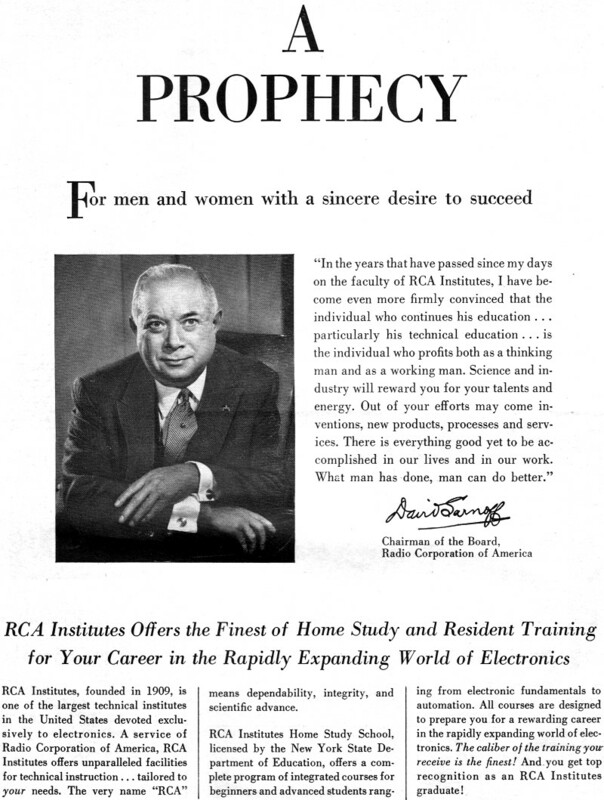 In the original radio broadcast of Jean Shepherd's "A Christmas Story," which was set in the Great Depression era, he spoke of magazine advertisements promising rewarding careers in electronics for men of adventure. 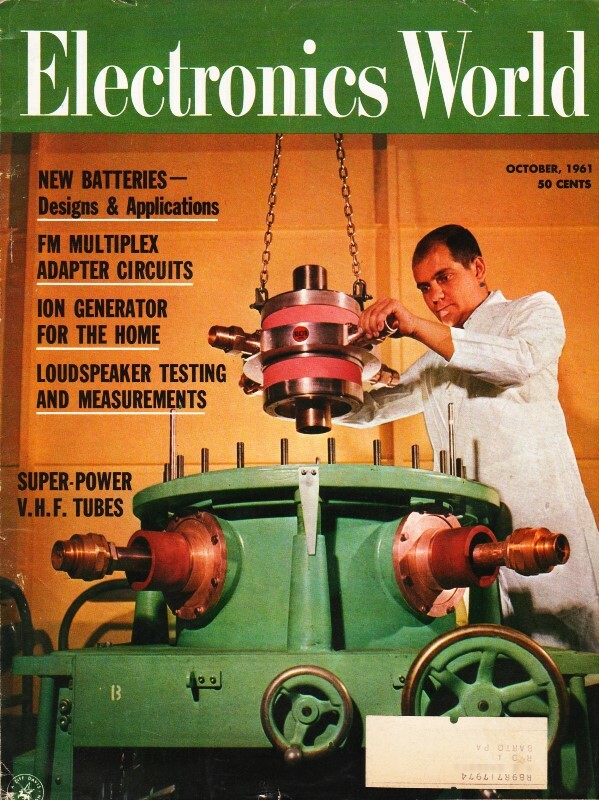 Over the last few years I have posted many such advertisements from vintage electronics magazines, but they were also commonly seen in women's magazines, Life, The Saturday Evening Post, and many others. 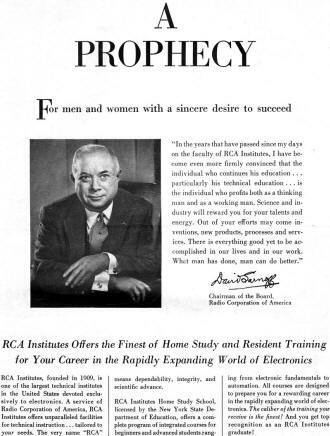 This ad pitching the Radio Corporation of America's (RCA) home study courses for electronics technology ran in a 1961 edition of Electronics World. Chairman of the Board, David Sarnoff, sends the message to readers. Sarnoff was commissioned as a Brigadier General in the Army Air Corps during World War II. He orchestrated radio broadcasts for the D-Day invasion (June 6, 1944), and also the Radio Free Europe system for post-war years. "In the years that have passed since my days on the faculty of RCA Institutes, I have become even more firmly convinced that the individual who continues his education ... particularly his technical education ... is the individual who profits both as a thinking man and as a working man. Science and industry will reward you for your talents and energy. Out of your efforts may come inventions, new products, processes and services. There is everything good yet to be accomplished in our lives and in our work. What man has done, man can do better." RCA Institutes, founded in 1909, is one of the largest technical institutes in the United States devoted exclusively to electronics. A service of Radio Corporation of America, RCA Institutes offers unparalleled facilities for technical instruction ... tailored to your needs. The very name "RCA" means dependability, integrity, and scientific advance. RCA Institutes Home Study School, licensed by the New York State Department of Education, offers a complete program of integrated courses for beginners and advanced students ranging from electronic fundamentals to automation. All courses are designed to prepare you for a rewarding career in the rapidly expanding world of electronics. The caliber of the training you receive is the finest! And you get top recognition as an RCA Institutes graduate! Voluntary Tuition Plan. The important thing to remember about RCA Institutes Training is the convenient, no-obligation payment plan. This plan affords you the most economical possible method of home study training because you pay for each study group only when you order it. If you interrupt your course at any time, for any reason, you owe nothing more. You never have to pay for the whole course if you don't complete it. No other obligations. No monthly installment payments! RCA Instruction is Personal. With RCA Home Study training you set your own pace in keeping with your own ability, finances, and time. The Institutes allows you ample time to complete the course. Your lesson assignments are individually graded by technically trained personnel, and helpful comments are added where required. You get theory, experiment, and service practice beginning with the very first lesson. All lessons are profusely illustrated. You get a complete training package throughout the entire course. You Get Prime Quality Equipment. All kits furnished with the course are complete in every respect, and the equipment is top grade. You keep all the equipment furnished to you for actual use on the job ... and you never have to take apart one piece to build another! Resident schools in Los Angeles and New York City train you for any field of Electronics you may choose! No Previous Technical Training Required For Admission. RCA Institutes Resident Schools in Los Angeles and New York City offer training that will prepare you to work in rewarding positions on research and production projects in fields such as automation, communications, technical writing, television, computers, and other industrial and advanced electronics applications. Even if you did not complete high school, RCA will prepare you for such training with courses specially designed to provide the basic math and physics required for a career in electronics. Free Placement Service. RCA Institutes graduates are now employed in important jobs at military installations such as Cape Canaveral, with important companies such as IBM, Bell Telephone Labs, General Electric, RCA, and in radio and TV stations all over the country. Many other graduates have opened their own businesses. A recent New York Resident School class had 92.06% of the graduates who used the Free Placement Service accepted by important electronics companies ... and had their jobs waiting for them on the day they graduated! Coeducational Day and Evening Courses. Day and Evening Courses are available at Resident Schools in New York City and Los Angeles. You can prepare for your career in electronics while continuing your normal full-time or part-time employment. Regular classes start four times each year. RCA Institutes, Inc. A service of Radio Corporation of America, 350 W. 4th St., New York 14, N. Y.,610 S. Main St., Los Angeles 14, Calif.